Emma Routh plays at Frankston Park in Frankston on Friday. Emma has a genetic disease called Fanconi Anemia which can result in skeletal anomalies, leukemias and bone marrow failure. PALESTINE — By personality, 3-year-old Emma Routh is a lot like other little girls. She likes play dough, Dora the Explorer, snow and dancing every time her favorite singer, Taylor Swift appears on TV. But her mother knows that Emma, who weighs 10 pounds less than her 8-month-old brother, may never have the chance to grow up like other little girls. On June 23, Emma was diagnosed with Fanconi Anemia, a genetic disease that shuts down her body’s ability to produce blood. Emma’s only chance for a cure is a bone marrow transplant. Now, weighing 18 pounds, Emma is unable to play outside with her two brothers, go to school or attend her gymnastics classes. Because of her low blood count, doctors worry her body would be unable to heal itself if she fell or came in contact with germs. If the transplant is not done within the next year, Emma faces the possibility of leukemia, organ damage and a shortened life expectancy. “I don’t want to think about the ‘what if’ — I would go crazy. I can’t even stay not doing anything for 33 minutes,” her mother Brandy Routh said. Mrs. Routh, a full-time student, withdrew from her classes to work full time on the search for her daughter’s donor. “No one in the family is a match and we haven’t found a match of the national registry,” she said. While her mother spends hours on the phone with media, bone marrow groups and collection centers, little Emma sleeps. She sleeps between 14 to 16 hours a day — tired from a lack of blood. Emma was born two and a half months premature, so her small stature was no surprise to her parents, but eventually when she stopped getting bigger they knew something was wrong. “I looked at the growth chart at her doctor’s office and it looked like it just stopped growing,” Mrs. Routh said. Further tests revealed Fanconi Anemia. Other than not physically growing, the 3-year-old has developed fine. “She tests above average, and is mature for her age. She walks and talks normally,” her mother said. Because of Emma’s level of awareness, her mother is challenged with finding a way to explain to her daughter why she is sick. “One of the first things they told us was that she couldn’t go to school because of the germs,” Mrs. Routh said. That conversation was one of several Emma overheard and became upset with. After her diagnosis Emma was shown a video at the hospital that used Cabbage Patch Kids to explain the danger of germs and what happens during chemotherapy. For the Rouths, the past month has been a crash course in bone marrow transplants. “We knew nothing about this until three weeks ago,” she said. What the family has learned is that a bone marrow transplant will help Emma begin producing blood and that the more people there are on the registry the greater her chances are of finding a match. Currently, more than 1,400 patients receive transplants through the National Marrow Donor Program (NMDP) each year. Mrs. Routh’s plan is to increase her daughter’s chances for survival by increasing the number of donors in East Texas. The Routh family, with the help of Because I Care, a Longview-based tissue-typing recruitment group with the NMDP, has organized a bone marrow drive on Aug. 16 at Green Acres Baptist Church from noon to 4 p.m. The group also raises funds to defray the cost of tissue typing and plans to pay for up to 400 tests at the drive. A second marrow drive is set at family’s church, Dogwood Hills Baptist Church in Palestine, on August 23 from noon to 6 p.m. Stewart Regional Blood Center has agreed to tissue type 250 people. “This isn’t just about my child. It’s about children everywhere. Everybody needs to get out and donate,” she said. Anita Quinn, donor coordinator of Because I Care understands Mrs. Routh’s desperation to find a donor. Her son Bryan was diagnosed with acute leukemia in 1998, but at that time there were only 75,000 people on the national registry, compared with the nearly 7 million today. One week after Bryan graduated high school, he learned he would need a bone marrow transplant. To pay for the cost of tissue typing, his mother and friends organized a walk-a-thon. Thousands of dollars later, they found a match, a woman who lived in England. “His donor was a petite woman. How much more different could they be? But she was a perfect match,” she said. 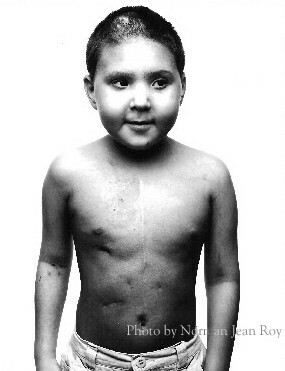 Bryan’s transplant went well, but he died three years later at the age of 22. Still, Ms. Quinn believes her work has a silver lining. Since the formation of Because I Care, more than 14,000 potential bone marrow donors from East Texas have been placed on the national registry. Once a person decides to become a donor, they are assigned a number and listed in the national donor registry, a computerized data bank that was established by Congress in 1987. If they are a match for someone in need of bone marrow, they can be contacted to donate to anyone in United States. During the registry drive, a potential donor’s mouth will be swabbed and the sample will be sent to a laboratory for typing. It could be years before a person is matched, or they could never be matched, Quinn said. According to the NMDP, if your tissue type is a match, you will be told the gender, age and disease of the person who will receive your donation. Quinn said that it is up to the donor to decide if they want to continue with the donation. Anyone in good physical health between the ages of 18 and 59 can become a donor. It costs $52 to tissue type a Caucasian, but Quinn explained that there are more federal funding and grants to tissue type minorities. According to the NMDP, some patients have more difficulty finding a donor than others. While a match can be anyone, often closer types are found in similar racial or ethnic groups of the patient. Malone added that she has seen an African American match with a Caucasian and vice versa. “You just never know,” she said. Part of the problem Quinn has found while working with bone marrow donors is a misunderstanding of what the donation process is like. “One thing I hear a lot is a comparison to a marrow biopsy,” she said. A bone marrow biopsy is done with a local anesthetic while the patient is conscious. In most transplant cases, there two different procedures that can be used to donate. The first is a day surgery where doctors make tiny incisions on the donor’s hip bones, insert a needle and extract the marrow. According to information from the NMDP, while the donation process varies slightly from hospital to hospital, the surgery is usually done with the patient lying on their stomach with three to four incisions less than one-fourth of an inch long are made for the marrow extraction. The marrow is then removed through a hollow needle. The surgery, on average, lasts about 45 minutes to an hour, and the patient does not require stitches. Ms. Malone said that when she donated marrow three years ago she was walking around the next day. “I didn’t feel it when it happened, but afterwards there was some soreness in my hips — like a bruise after you fall,” she said. Ms. Malone’s surgery was on a Thursday, and on the next Saturday she said she attended a bluegrass festival. The second way a donor can be asked to give is through a Peripheral Blood Stem Cell donation. The donor is given a series of injections under the skin that cause the marrow to release more blood-forming cells into the blood stream. “They are then collected with a machine similar to that used in platelet or plasma” donation, she said. Another concern Ms. Malone said she has heard is patients worried donating will compromise their immune system. The average amount of marrow and blood donated is about one quart and less if the patient is a baby or child. A benefit fund for Emma was set up First State Bank in Noonday, Palestine and Frankston. For more information about donating to the Emma’s transplant fund, contact Brandy Routh at marrow4emma@aol.com. Joe and I went to Redskin training camp this weekend. It was us and 28,000 hot, sweaty fellow Skins lovin' folks enjoying some football in the 90 degree weather. We actually had a good time talking in the car while we waited in traffic for the hour it took just to park. I don't think they were ready for so many people. In the end, we decided to bail out, park somewhere close by and walk a half-mile to get in. I have never seen players up so close before. I put Joe up on my shoulders so he had one of the best seats in the house. The Super Bowl trophies were a definite plus. I think your brother had a good time. He has seen pictures of you and Jack at games and reminds me often that he hasn't been. We are going to remedy that this season. And I think Joe will be playing football himself this fall. There is a kid in his class who plays in a league, and he and his dad want Joe to join their team. More on that as it gets cooler out. One of the notes to myself read, "figure out a name for production company." I am making all of these videos and doing books online and that sort of thing, so I need a fun production company name for all of these things. One of my favorites of all time is "The Glimmer Twins." That's what Mick Jagger and Keith Richards call themselves. Jack is a Stones fan now. He wants to see them if they tour again. Last night, Mom and I were treated to an all-naked Joe doing his not-safe-for-YouTube gyrating dance routine atop our bed after he got out of the shower. That's when the light bulb went off. 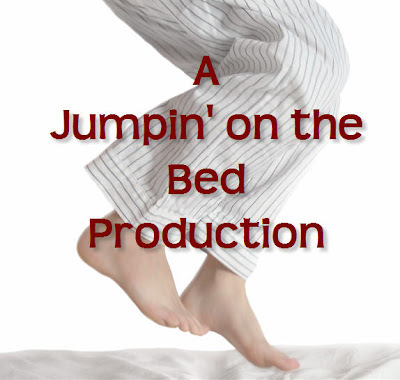 Jumping on the Bed Productions. I need to commission an animated kid doing a flip or somersault on a bed and sticking the landing. I wrote some notes down a few weeks back and this news made me go back to look for them. As I’ve said before, I have an ongoing conversation with you in my head. Only 20% or so of what I think makes its way into these letters to you. I write down notes or send myself emails about what I am thinking, but then I get too lazy to put it on here. I listen to books on my iPod. For some reason I get a bit sick to my stomach when I read on the bus. It started this year. So I get a book to listen to on my way to and from work. I figure I am saving the planet and getting a little bit smarter all at the same time. One of the books I listened to recently was Randy Pausch's Last Lecture. He is a guy who is about my age who is dying of pancreatic cancer. His book is taken from a lecture he gave after he knew he was dying. The lecture was given at Carnegie Mellon University in Pittsburgh. Carnegie Mellon is where my friend Mike went to college. I used to visit him there a lot. In the lecture, Randy Pausch talks about how to live life and how to die. He provides “life lessons” for his kids, and millions of others who are buying his book and watching his video on the Internet. It is a magnificent way of saying goodbye. And a beautiful gift to his family and friends. When you are shooting around in basketball, you want to make one last “really good shot” before you leave the court. You can’t go out on a miss. It has to be a shot of substance, like one from the foul line or behind the arc. If Joe is practicing hitting, he needs to hit a nice fly ball, not a grounder, to wrap things up so we can go home. You can have that last really great shot in life too. I was thinking about this with Tim Russert. I had just watched the last Meet the Press show the weekend before he died. When I was watching I was thinking that it was one of the best episodes of the show I’d ever seen. My own personal takeaway from the Last Lecture is that you should go for the “magic” in life with guns ablazin’. He tells a story about how he painted his room when he was a kid. I think he includes the story for a few reasons, but one of the most important is to say to parents or anyone in authority, “let people try, let them express themselves.” He says in the lecture if your kid wants to paint the walls of their room, let them do it. What is a room anyway. It isn’t like anything is getting broken or anyone is getting hurt. My first inclination when Joe wanted to put all of the pictures of sports heroes on his walls was, “no way.” I mean, we painted your bedrooms and put up wall paper and stuff. But you know what, it is his room and that is his space. He is expressing himself. Mom was totally into it, and I adjusted my thinking in about 2 seconds. I know that he got his inspiration from Jake Mintz’s room. I should take a picture of the room and put it here. Your little brother has run out of room in his room. Two days ago I helped him blaze a new trail. We put a poster of Gilbert Arenas up on his ceiling. I placed it right over his bed so Joe can see it when he opens his eyes in the morning. Joe bought it at the Basketball Hall of Fame last weekend. With the pictures and the posters and the baseball cards spilling from every nook and cranny, his room - your old room - is a very magical space. I think we made your life pretty magical too. Mom was the prime mover on that and she inspired me, like she did with Joe’s room, to get with the program and to work hard at it. Since he wasn’t going to be able to be with them as they grew up, Randy Pausch includes some specific advice for his kids about living life and achieving your dreams. There were a few things he said that I thought were worth putting down on here, but I have forgotten them. Maybe I will relisten to the book. I have my own stuff I think is important to impart to your brothers. I think I’ll use the new blogs to tell them. I have dearjoe.org and am trying to get dearjack.org too. I give your brothers a few how to live life suggestions everyday, as does Mom, but I think writing things down for them to read someday will help reinforce the message. In fact just the other day I realized that I am entering a new phase with Jack. We are starting to communicate through email. I told him something on my way out the door to go to work, and when waiting for the bus I wrote him an email – which he now uses to keep in touch with friends from camp - with more thoughts on the subject. The subject was being nice to Joe. I had told him that now that he’s back among us he needs to try and be nicer to his/your younger brother. I said that he should do the opposite of what he normally would do. If he wanted to ignore Joe, he should instead engage him. Ask him how he is doing, what is he up to. I explained it might just freak out Joe enough to make him less annoying to Jack. When I got to the bus stop, I sent Jack an email and encouraged him to look at this challenge like he is an actor playing the part of the nice, concerned, loving older brother. If he can put it in that context, he might actually grow into the role. It may become natural to him. I will look through my notes for some of my life lessons. I did find something I emailed to myself that just says, “speak… listen.” That's a big one for me. I’ll explain that one in another letter. My Shrink Says ... Blog! Why do people write confessional blogs? It's a creative outlet. It's a forum to vent. It's an exercise in exhibitionism. To mental-health experts, though, it's more than that: a blog is medicine. Psychiatrists are starting to tout the therapeutic power of blogging, and many have begun incorporating it into patient treatment. A forthcoming study in the journal CyberPsychology & Behavior even suggests that bloggers might be happier than nonbloggers. Mental-health experts say blogs are a step up from plain old diaries, chiefly because of the built-in audience. As kids, we learn that if we air our problems, we get help. We associate communication with consolation, particularly when the going gets tough. Blogging fulfills that primal need for sympathy. "Writing is an effort of the brain to communicate for comfort," says Harvard neurologist Alice Flaherty. "Diaries are a form of that communication, but removed. Blogging gets you closer to that sympathetic audience, and that's what makes it therapeutic." According to psychologist John Suler, the anonymity of blogging provides another therapeutic boost: it's high intimacy with low vulnerability. But blogger beware. "Revealing too much," says Suler, "can cause shame or guilt." So blog to your heart's content, but leave some things to the imagination. I was reading an old magazine at Matt Katz's office this morning waiting to see him, and came across this article. The timing is perfect. I have a big announcement. After writing more than 1,000 letters to you I've decided to branch out. Shortly, I will start one of these for each of your brothers. I will create separate "Dear Jack" and "Dear Joe" blogs where I write things to both of them. You all have an equal share of my love, and now they need to get equal attention online. I will continue to write you. I love you. We booked our flights to England. Here is a picture that Uncle Andy took of the place where they are going to live. 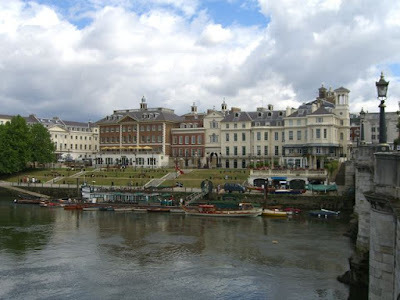 It is called Richmond. Their house is right behind those buildings. It is smack dab on the "green." City living. We'll be there for Rosh Hashanah. I haven't been to England since I studied there 25 years ago. I'm excited to go back. Picked up Jack. Was kinda nervous about how we'd find him. Thought he'd be a mess and mad at us for not getting him when he sounded the alarm. I shouldn't have worried. He was better than fine. We drove up on Saturday and went to the Basketball Hall of Fame in Springfield. Joe and I went to look at the exhibits for -- ohhh - about 2 minutes and then we went straight to the court on the ground level. Joe shot hoops for an hour and a half. It was worth the price of admission. After sitting in the car for 7 hours it was the perfect way to stretch the legs. After Springfield we went to our usual hotel in Sturbridge and hooked up with Jodi, Rodd and Luke. Joe and Luke ran around and had a blast. Mom was dying to be so close to camp and not able to see Jack for another 12 hours, but she hung on. When we got to camp with the usual caravan of cars with DC and Maryland plates we rolled up to Jack's bunk and there he was. Smiling. Mom didn't wait for the car to come to a stop. After Mom got hers, I asked Jack to come around to the side of the car where I explained to him that I was going to hug him until his insides squeezed out. And because I am such a good dad I was going to do it out of sight of his buddies. No embarrassment for your brother. It felt good to put him in the "Daddy Jail" again. We did the normal walking around and lunch at Rondeau's. The trip back to DC was uneventful. Before we got him I thought that I'd debrief Jack in the car on the ride home on just what the heck happened that got so bad the camp told us to come get him. But it didn't seem like the right time. I want to give him some distance and then I'll ask. Very curious to understand what he was thinking and feeling. Mom thinks it is related to all of the sadness we had around the garden dedication and graduation. Me, not so much. I don't want to be insensitive to how Jack feels about you, but I also want to give him room to feel sad or weird or bad about the stuff that we all experience. Friends. Girlfriends. Disappointments. Frustrations. All that life stuff. I did learn the "Ga-Ga" tournament story was just that. A story. A myth. Jack says he doesn't know where it started, but it is way overblown. I don't care. I am just glad that he had a good time. One day last week, cousin Joshua was Camper of the Day at Home Run and guess who was the Camper of the Day the following day. That's right. Joe. I'm very proud of him. It's hustle that wins that award. Joe is loving camp so much that he asked if we would leave him in "After Care" so he could play more baseball (kind of the opposite of Jack at Ramah). It normally ends at 3:00 pm, but Joe now stays until 5:00 pm playing ball with a few other kids who don't leave for one reason or another. Here is everyone assembled on the bleachers for Coach Mac's pep talk. I like the character building even more than the baseball fundamentals. Joe may feel otherwise. Your brother is the one without the hat sitting next to Joshua. Even though Coach Mac stresses the importance of wearing your uniform, Joe seems to selectively tune that out. Oh, and one other thing. Joe's cleats stink. Bad. Really, really bad. Make you want to gag bad. I take them and air them out each night but I think he redoubles his efforts the next day to make them reek of the foulest smell ever. 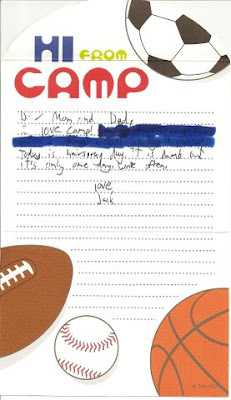 Jake is there for his last year as a camper. He'll be a junior coach next year. Jake continues to be an excellent player, and for the second year in a row he is heading up to Bristol, Connecticut for the Little League World Series semifinals representing Washington, DC. He is so big now. I look at him and don't exactly think - "that's how big Henry would be" because you were definitely going to be on the short side. A lot of the FA kids take growth hormones. It seems to work. This is an email we all got early last week from Richard. Subject: On to Bristol . . . The Capitol City Little League won the DC Little Championship Tournament with a 14-7 win over Northwest Little League, qualifying for the Mid-Atlantic Little League Tournament in Bristol, Connecticut, the next step on the road to the Little League World Series in Williamsport, Pennsylvania. Through the DC tournament, we won all of our games outscoring opponents 52-7 – very good all around team effort. For the Mintz clan: Batting second tonight, Jake went 3 for 3, with two doubles, a walk, 4 runs scored and 4 RBI’s. He made a sterling stop at second base, saving two runs and then pitched in relief for two solid innings. Lots of work ahead of us to prepare for the tournament, just 18 days away. We play games in Bristol on Aug 1, 3, 4, 5 and more if we keep on winning. Let me know if and when you’ll be joining us in Bristol and I’ll make a room reservation for you at the Marriott Farmington. 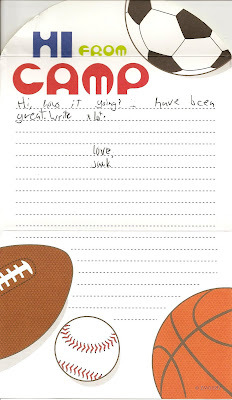 Jack has been at camp for almost one month. We are going up to Massachusetts to pick him up on Sunday. Remember how I said how psyched Jack was to be at camp. Well it turns out to have been a pretty uneven month for big Jack. 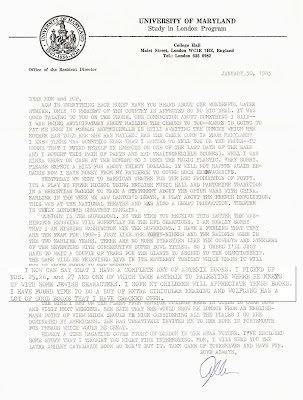 We got contacted by the camp right before the Fourth of July - which was almost the halfway point. They said your little brother was incredibly sad and wanted to come home. Normally, kids get homesick for a little while and then get over it. The interesting thing is the camp folks thought he wasn't going to get over it. Wow, that was a bit of a shocker for us. So we had a tough decision. Mom and I talked about it and agreed there were a lot of reasons why he should stay. We also looked at some of these pictures of Jack among all the photos the camp posts on its website. His smiles told us that there were definitely times he was enjoying himself. We told the camp that we thought Jack should stay until the end. On July 4th or 5th, Mom called back to check how Jack was doing. The person she talked to there told her Jack had a really good night the night before. There was a Ga-Ga tournament (did you ever play Ga-Ga - great game - Israeli bomb shelter dodgeball) and it wound up being Jack pitted against a counselor after everyone else was eliminated. All the campers were chanting, "Jack, Jack, Jack." As you can imagine, that gave him a real boost. He seemed to get past the sadness and start enjoying the experience. I am interested to hear what he has to say on our trip back home. I home he actually did turn it around, and that he isn't too mad at me and Mom. We'll see, we'll see. I'll report back. Big Michael and Big Hannah are in town with their kids from Ann Arbor for two weeks. They came over for dinner last week. And then last night the plan was to meet Michael in Annapolis and go racing on Uncle Andy's sailboat. Mom and Joe went on Uncle Andy's brother Jon's powerboat to watch the race. Mom told Jon that she had never under the Bay Bridge so he sped over there before the start, and Mom took some pictures. Joe had a great time out on the water. You'll note the puka shell necklace he is sporting. That is because on our way out there he told us that he wanted to look "beachy" and "boaty." He is a funky guy. We got all set to go and then the starter announced we wouldn't race because there was no wind. That was a bit of a bummer. Instead we all got on Jon's boat and went over to Kent Island for dinner. There was a beautiful sunset and almost full moon at the same time in different directions. Very cool. Great evening. We're lucky people to be able to do all these fun things. I read this, thought this was funny and totally agree. I think the person who wrote this must be a med student. It is a little thing, but it is Fanconi not Fanconi's. A lot of people who we'd tell about you would say "Franconi." I bet that is because there is a Franconia in Virginia off 395 not too far from here. I can understand wanting to have a star, planet or dinosaur named after you, but a disease? I guess it is an honor in a weird way. I am glad that the Hope for Henry Foundation is called the Hope for Henry Foundation. Medstudentitis: "Thursday, July 10, 2008 at 7:16 PM"
I think they should stop naming disease after people. I have too many names going through my head. And, if you get one disease, you shouldn't get TWO: i.e. McCune-Albright and Albright's osteodystrophy, or Fanconi's anemia and Fanconi syndrome. pick ONE. We went to Aunt Abby and Uncle Andy's house in Rehoboth for July 4th. I think it is a tradition now. Their beach house is just so beautiful. It was in Washingtonian Magazine this month - one of these days Mom is going to be featured in there as well as a "Washingtonian of the Year" for all that she does for sick kids at Georgetown. It rained for a bit and I was lucky enough to read and then fall asleep on this really comfy couch they have on their screened-in porch. I cannot tell how how incredibly perfect that was. It doesn't take much for me to be happy. For Joe to be happy all it takes is Funland, Funland, Funland. He even went on Sea Dragon with Joshua. I guess he is growing up. I need to tell Jack that his favorite ride, Chaos, is gone. It was sunny too. Joe is getting more comfortable in the water, but he has a ways to go. Noah is an awesome maniac. Non-stop dynamo. Michael, Rachel and Josh are fish. They're also good off the diving board catching a ball while getting squirted by Uncle Andy. The anniversary of your transplant, July 6th, passed by without much fanfare. Neither Mom or I mentioned it to the other. I think it must be all the time that has passed. Or it could be we were tired of being sad. June was really hard. Joe and Mom saw the ESPN Wish story this morning on TV. Joe said, "that's just like Henry. Mom said, "Joe, when you are a major leaguer, you can help kids like that. Tonight Mom and Joe were in Bethesda when I got home. Since I was alone I turned on the TV and made myself some dinner. This story was on SportsCenter. Balsamic vinaigrette and tears aren't necessarily a bad combination on a salad. This kind of thing rocks my world. Way to go Make-A-Wish. 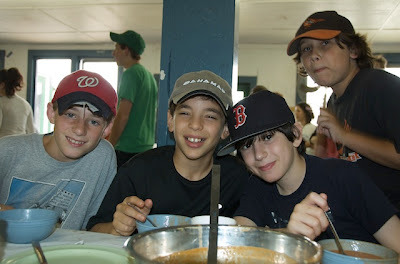 This summer, Jack clearly is doing what he loves - Camp Ramah, as is Joe - Home Run Baseball. They couldn't be any happier, which of course means... Mom and I couldn't be any happier. Okay, Mom could be happier if she and Joe and I were up in Massachusetts with Jack at camp. It is very tough on her not seeing Jack for a whole month. Ramah posts photos online from time to time. Mom is all about finding shots of your brother. She even scans the backgrounds for a sighting of him. Here is the only one they have put up so far. In years past, we coached him to throw his body in front of the camera. He couldn't care less. Maybe even better than this lone photo are the two letters we've already gotten - he has only been there about 10 days or so. I bet the counselors make you write a letter to be able to get canteen or something like that. That's how it was back in my day. As you can see, Jack says he is having a great time. Mom is resting easier now. A little while ago when I was cleaning out the garage I found a bunch of letters that I wrote home to Grandma Phyllis and Papa Teddy. Papa must have given them to me after cleaning out their garage after Grandma died. There are letters from when I was at Camp Tel Shalom, aérogrammes from when I went to Israel with USY Pilgrimage and long-winded typewritten missives from when I went to school in London at University College. I guess I have always been a letter writer. My cool Snoopy stationery has given way to emails and blogs. 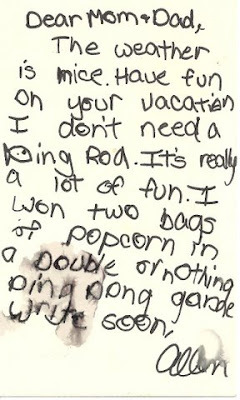 I am pretty sure this letter was written in 1974, so I was a year or two older than Jack is now. Check out the multi-media. That is a drawing of a fish. I sat on the couch and read a bunch of these to Mom the other night. I used to tell Mom that I was sorry we didn't have any daughters because you boys weren't gonna share anything too personal with her. Generally, I don't think guys talk about certain things - like their feelings - with their parents the way daughters do. But strangely, in these letters, I started reading to Mom a lot of very intimate things that I was writing to Grandma and Papa Teddy. I was telling them stuff like, "I'm in love." So there is hope for Mom. I thought this one letter was pretty cool. I wrote this one from London. It says how I bought all of these Asterix comic books and how I hoped my kids would appreciate them one day. It turns out that Jack is a huge Asterix fan and he also collects the books. Joe may be "amazing," but I am "prescient." I love you. Joe, Mom and I went to see the Nationals play the Orioles on Sunday. We went with our friends the Soslands (they met at Camp Ramah when they were kids and ended up getting married!) and found ourselves sitting with the Shoyers. At one point I looked up and saw "Happy Birthday Andy Shoyer" on the scoreboard. Mom called Paula (how many Andy Shoyers can there be, right?) and sure enough they were all at the game. They had open seats by them, so we sat with Joey, Jacob, Paula and Andy. I am going to send some of these pictures to the Goldberg and Shoyer kids who couldn't be there because they're up at Camp Ramah. Speaking of the scoreboard, you have to check out Mom on the Jumbotron. She was up dancing with Paula between innings and they were filmed by one of the stadium cameramen. Also, check out Joe "bringing the heat" with a 38 m.p.h. fastball against A-Rod. The game was incredibly exciting. The Nationals won on a walk-off home run in the bottom of the 13th inning.